Amateur and professional writers from across Cumbria and further afield are in with a chance to receive widespread recognition with the 2019 Lakeland Book of the Year Awards. Entries are now open for the prestigious competition, which can include any book published in 2018 set in or featuring Cumbria. Founded by Hunter Davies OBE 35 years ago and supported by Cumbria Tourism and main sponsors James Cropper, the Lakeland Book of the Year celebrates the amazing variety and quantity of writing that the Lake District, Cumbria inspires. The winner is whittled down from around 70 books each year, clearly showing that Cumbria is just as inspirational as when it was the setting for the work of Wordsworth, Coleridge and Southey. Each category winner (five in total) will receive a prize and recognition of their high-quality publication as one of the best from the last 12 months. However, only one of these will receive the ultimate accolade of the Hunter Davies Lakeland Book of the Year 2019. Fiona Armstrong (ITV and BBC newscaster, author, journalist and Lord Lieutenant of Dumfries). All six prizes will be presented at a charity awards event at the Castle Green Hotel, Kendal on 16th July 2019. Attended by authors, publishers and book lovers from throughout Cumbria and beyond, this annual event has raised thousands for well deserving local charities. Judge Eric Robson says “The Lakeland Book of the Year Awards – now in their 35th year and still going strong – are one of the most prestigious awards in the country and I am proud to be a long-term supporter. Cumbria and the Lake District are home to some of the most inspiring landscapes in the world and every year I am blown away by the staggering range and quality of entries we receive – it’s a delight and a privilege to read every single one of them”. 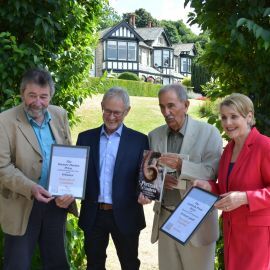 The awards were founded by Hunter Davies and Cumbria Tourism (CT) and are managed by organisers Chris Tomlinson OBE, Affra Hartree and Vicky Robinson MBE, with support from CT. Last year’s winner was “Picture of Cumbria” by Phil Rigby. The deadline for submissions is the 22nd March 2019. Entry forms are available at www.lakelandbookoftheyear.co.uk or from Cumbria Tourism (01539 822 222).